Beside Natural beauty and surrounding landscape makes the are the paradise of hiking & horse trekking. Our Company offering horse trekking and hiking tours based on local community. Nomadic families live in the area are main part of the tours. they will supply horses, meals and accommodation for travelers. Mongolian Nomads move 4-5 times a year looking good pasture for their animals. Every nomadic family prefer to live close to water recourse, forest, mountains and plentiful vegetation which is the best condition for the animal husbandry. Therefore Khuisiin Naiman Nuur Natural Monument is exceptional combination fresh water, lash green forest, picturesque mountains and many natural resources where animals and people leisurely live in summer time. Also, it is a valuable place for biological hydrologic study. These lakes with fresh water and interconnected by ground water channels located 5-30km distance from each other such as Shireet, Khaliut, Bugat, Khaya, Khuis, Onon, Doroo, Bayan-Uul, are called Khuisyn Naiman Nuur (Eight Lakes). Arrive in Ulaanbaatar and transfer to the hotel. City tour to the Central Square and Museum of National History and with its splendid collection of historical and cultural exhibits and Gandan the largest Buddhist Monastery of Mongolia , In the evening, enjoy Mongolian folklore show. Overnight at the hotel. After breakfast in hotel start tour to Karakorum, the 13th century capital city of Mongolia. On the way see sand dune that stretched more than 80km across the central Mongolian steppe. Afternoon, visit Erdene Zuu, once one of the largest monasteries in Mongolia and destroyed in the 1930s. Tour of the monastery grounds and several chapels with excellent examples of Buddhist iconography dating from the 16th century. Visit to the symbolic ruins of Karakorum, the 13th century capital of the Mongol Empire. Today we drive to the Tuvkhun Monastary. Tuvkhun Monastery is located on the top of the 2312 meter high Undur Shireet Mountain. 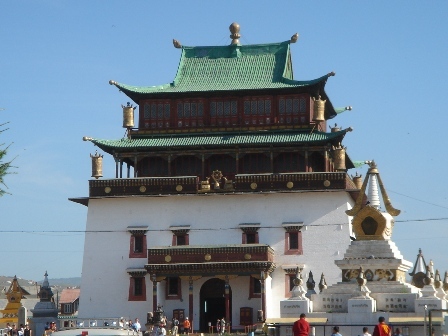 The monastery was established by the first Mongolian Buddhist saint, Zanabazar, in 1654. Zanabazar lived, worked and meditated here for 30 years. There are 14 small temples, a hermit’s cave, several pilgrimage sites as well as Zanabazar’s boot imprint on a rock. Overnight in ger camp. Continue driving and visit Ulaan Tsutgalan Waterfall. The waterfall is on Ulaan River which flows through basalt rocks formed by a unique combination of volcanic eruptions and earthquakes around 20000 years ago. Ulaan Tsutgalan Waterfall cascades from a height of 20 meters and is naturally most impressive after heavy rain. Afternoon we will stay in the camp for the preparation of the horse riding trip. Horse guides will brief instructions to ride horse and short riding to get confident with horses. relax in the ger. The first day of horse tour. Landscape: green meadows and forest. Accommodation: Tented camping near nomad family. Landscape: green meadows on lake side and forest. After leisured breakfast at the camp we will head to the Hujirt valley for the hot spa. Khujirt Spa is on the banks of the Khujirt river, at 1.748 meters above sea level. It includes bicarbonate, carbonate, sodium and sulfuric hydrogen. The spa water is used for treating nervous, back, extremities and cardiovascular diseases. After spa bath drive to the nearby ger camp and relax. After breakfast drive to the Ulaanbaatar. On the way visit Khustai national park to see the Takhi the central Asian last remaining wild horse well known as a Przewaslki's horses. Continuously drive to Ulaanbaatar and relax in hotel. Overnight at hotel. After breakfast at the hotel transfer to Chinggis Khaan international airport for departure flight.